I am no boat boat builder but with some research and advice from friends I decided that I would give it a go. This was my first canoe and I learnt an incredible lot throughout the project! 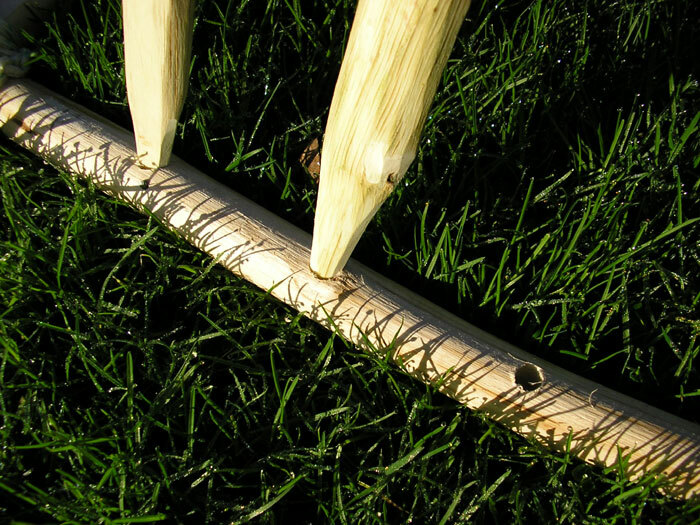 This article will take you through how I made the canoe but that doesn't mean that the methods shown are correct, it's just what I thought might be right. However the canoe does work really well and I am extremely pleased with it. Obviously it would be impossible write about everything that I did along the way because that would be a hell of a lot of writing, but I'll show you the basic concept. The boat building methods you use will vary according to to materials you have chosen or the purpose of the canoe etc. 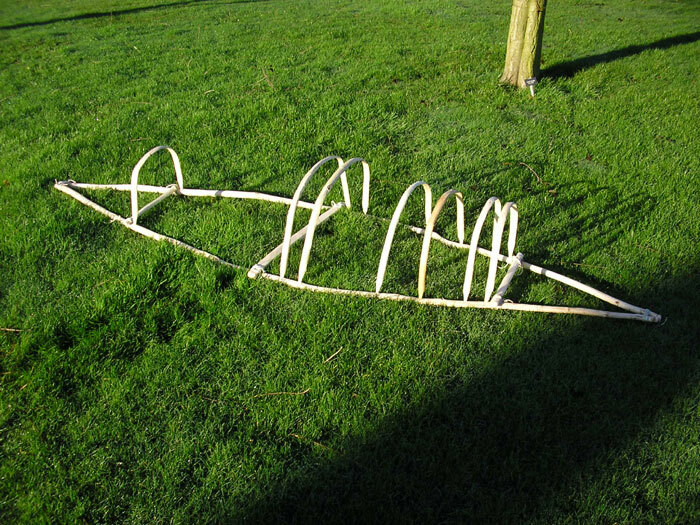 I then had to get another three pieces of wood to make the Thwarts (The Thwarts are the horizontal parts which help the canoe to keep its shape. The longer the canoe the more Thwarts you should have. 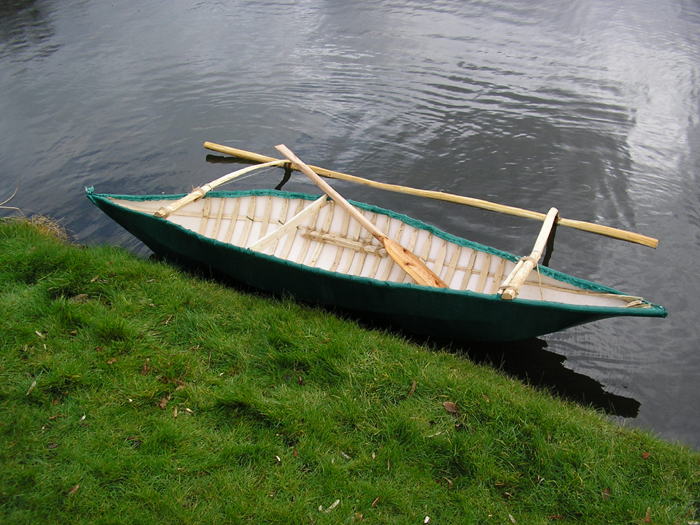 Small canoes like the one I made can have as many as five Thwarts. 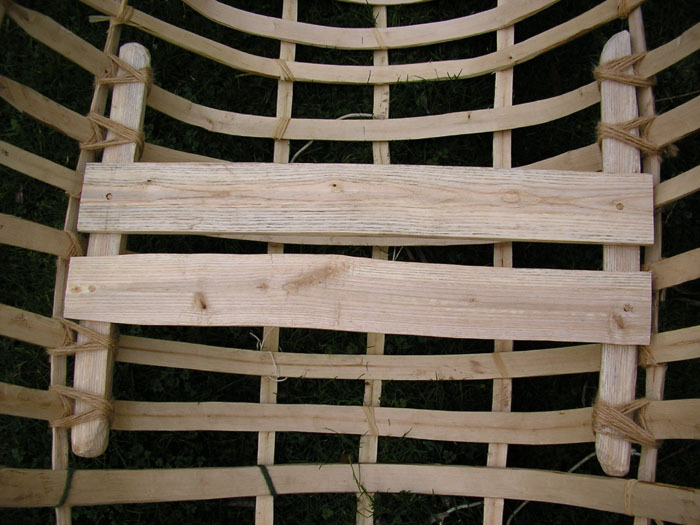 I worked out what width and length I wanted the canoe to be and then cut the parts to size and tied them together. The Thwarts in this photo are only temporary. I decided that my canoe was to be 3m long and I can't remember the width. However you will have to work out your own width size according to your preferences. The next job was to start to making the Ribs. For these I also used Hazel. Using an axe and a knife I made each Rib from a staff of green fresh Hazel. No two ribs are the same and this is a lengthy job which took me weeks of spare time. Don't rush! 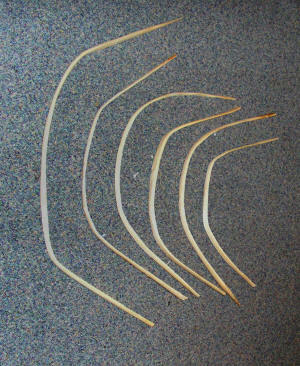 I carved flat ribs but you could use 1/2" thick willow shoots and just strip the bark. I used green wood to carve the ribs for a purpose. When the sap is still present the wood was supple and allowed me to bend them into shape. 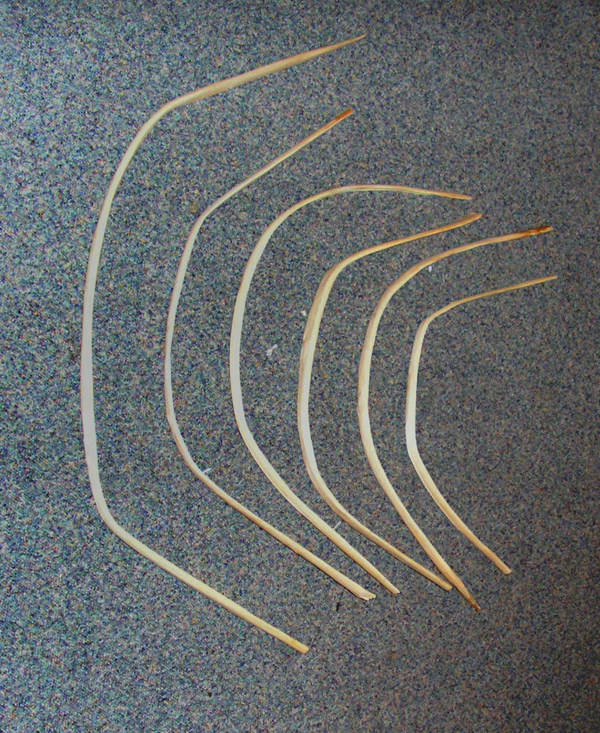 When I was satisfied with the shape of each rib I tied the ends together until they were dry. 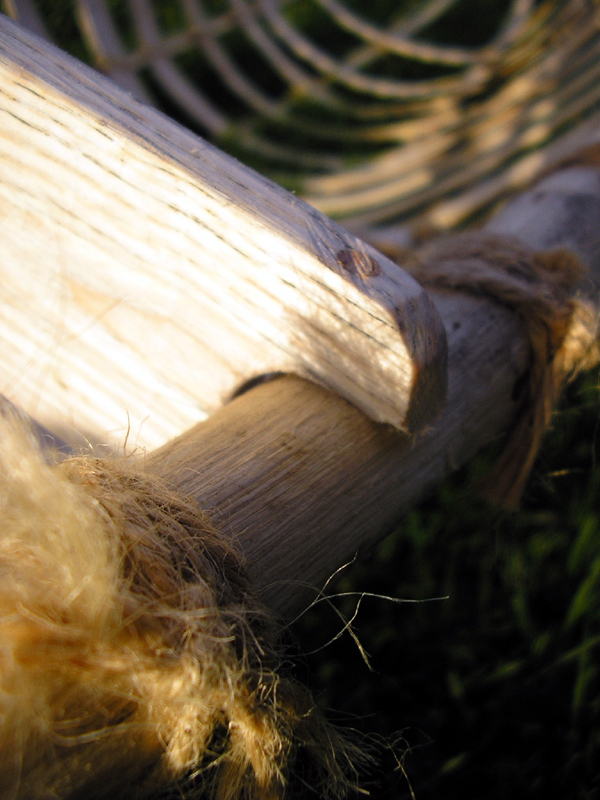 When the sap has evaporated and the wood is seasoned the wood will keep its new shape without the aid of the string. For me, the Hazel wood seasoned overnight on top of my hot radiator without splitting! This sped up the process a little. I found that every so often a rib would keep popping out of its whole so I secured them with string. Hopefully from the picture you can tell what I have done. obviously do this before attaching the canvas. Before too many ribs were fitted I replaced those temporary Thwarts with better ones carved from Ash. I strongly advise to get them right at the start and not bother with temporary Thwarts! Things can get a little tricky when fitting the new ones! The picture on the right shows how the thwart is connected to the Gunnel. 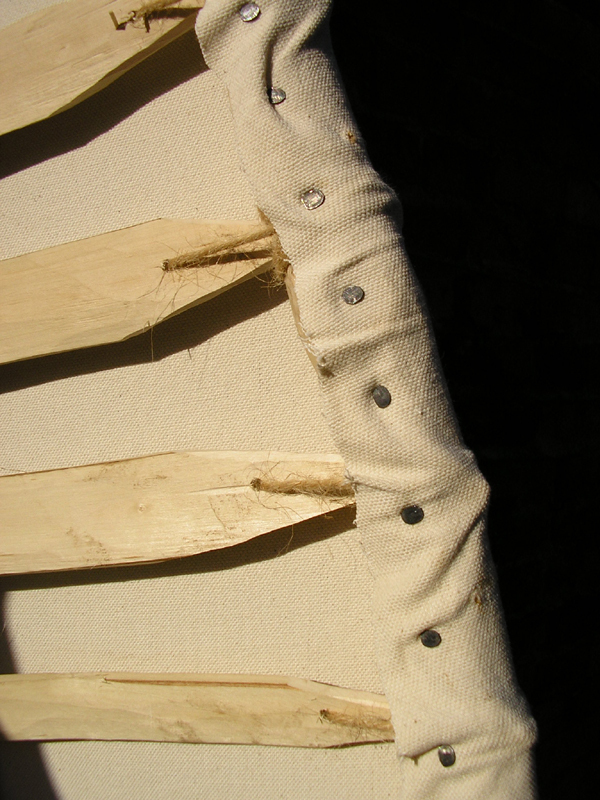 To hold all the ribs in their correct places I added longitudinals which stretch the full length of the boat. Each rib is tied to each longitudinal. I had 5 knots to tie for each rib! So if you have about 30 ribs to secure that will be 150 knots! make sure each one is tight! You don't want to be doing it all again! 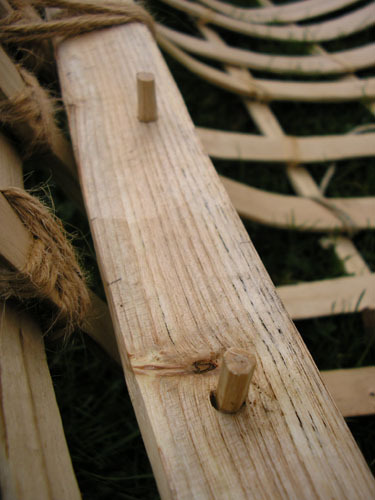 Slowly your canoe will begin to take shape! It's a great feeling of achievement when your boat has all its ribs fitted! 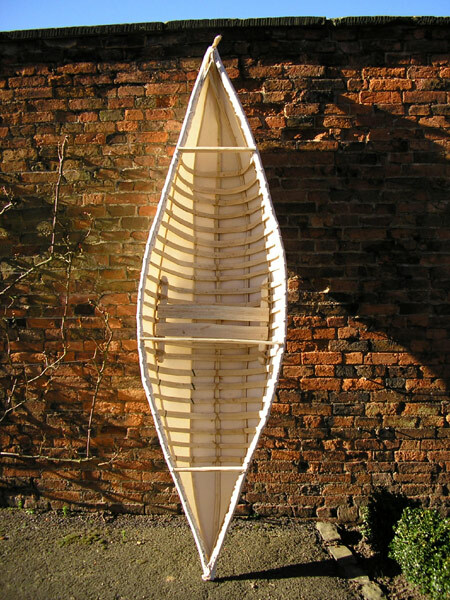 You will be enthused about progressing with the manufacture of your canoe! Next I made a simple seat. 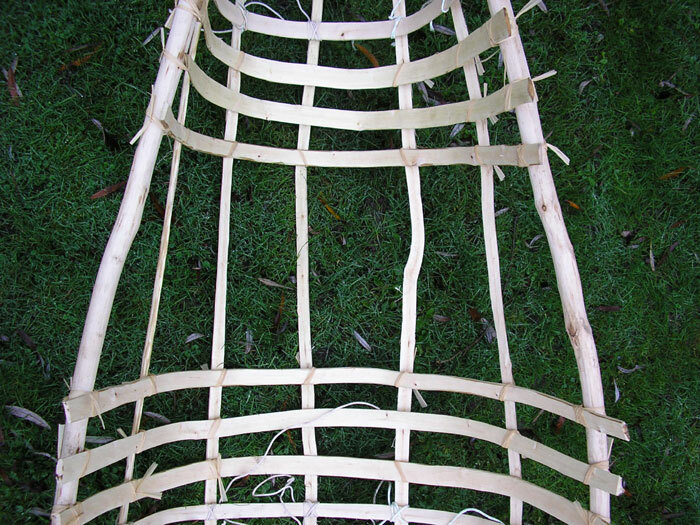 The front edge of the seat should be at the centre so that when you sit on it your weight will be slightly to the back of the canoe. The middle Thwart can act as a handy back rest. You don't want to be sitting bolt upright though. 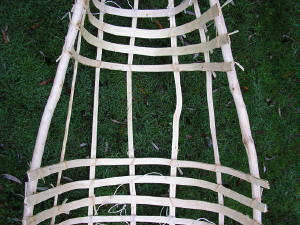 You can see how the seat is constructed from the picture. 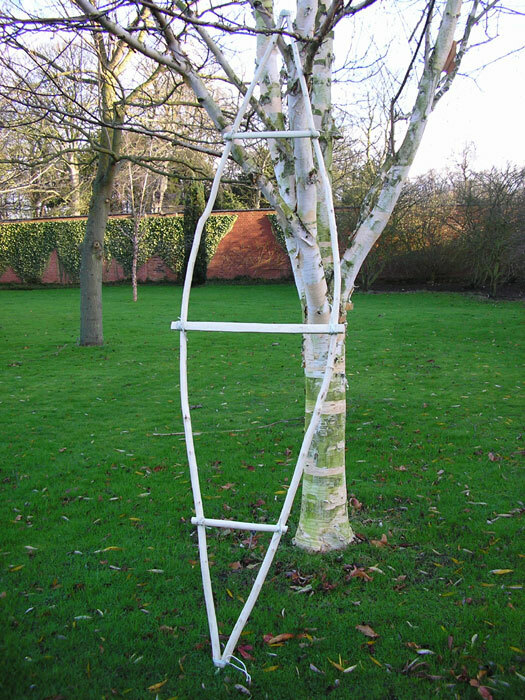 The seat supports are attached to two of the longitudinals and the longitusinals are held in place by the ribs, but at the same time the longitudinals are holding the ribs in place. Everything is holding everything in place. If you are wondering where the central Thwart is in the picture, I had to take it out for some reason but it is fitted again not long after. It isn't a good idea taking thwarts out though! Not at this stage! I made the seat removable so that you could kneel in the bottom if you wish. The first few times I used the canoe on didn't use the seat. I felt I had more balance this way. Using the seat soon became easy though. Another important thing is to make sure there is nothing in the boat which could catch onto your clothing. If you fall out you don't want to be tangled up with your canoe underwater. 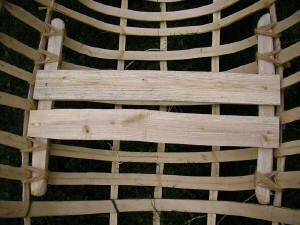 When the main structure of your canoe is finished to a good standard it is time to fit the canvas! This is the exciting bit! I chose the 9.5oz Cotton canvas. Make sure you choose a piece that is wide enough and give yourself plenty of extra to give you something to pull on. 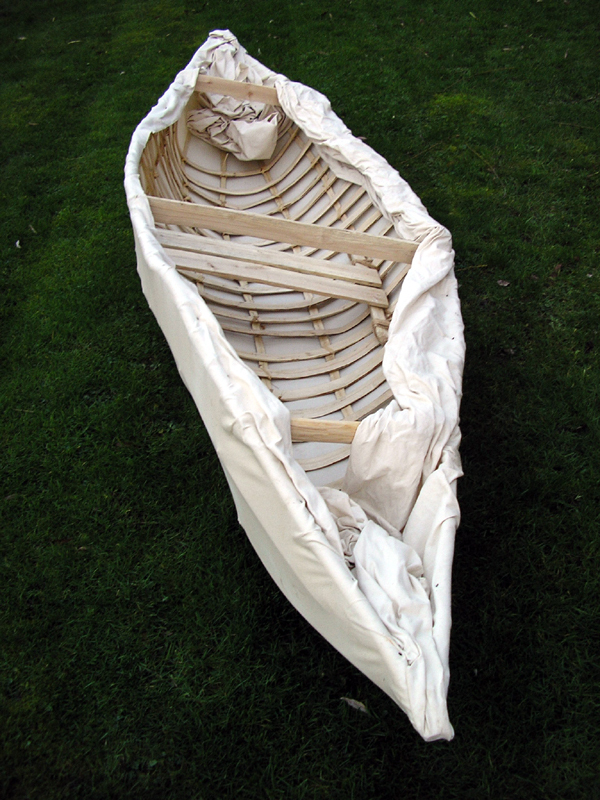 9.5oz canvas will enable you to stretch it and will fit to the shape of your boat a treat. 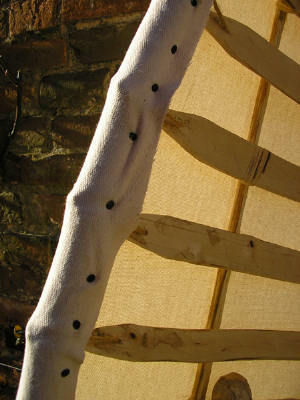 You need to get this canvas stretched over your canoe as tight as possible! No slack! Some people use ratchets and its always a good idea to have someone to help at this stage. However I did it without ratchets or help and I managed to get it pretty tight! Someone once said to me that if your hands aren't bleeding by the end its not tight enough! My hands were bleeding so I left it at that. The way I did it was to put a couple of nails in one side and then pull it up real tight the other side with all your strength! Bang the nails in on the inside of the boat into the Gunnels. Basically just go for it and use a bit of common sense. You should be methodical too. Because I was doing all this by myself it was very tricky! I had to hold the canvas tightly in place whilst holding a nail in place and then in the other hand hold a hammer! I don't know how I did it to be honest! When the canvas is as tight as you can get all over you can cut off the excess from around the top edge. Spray the canvas over with water to tighten it all up then leave to dry. If you have got this far then you need a real pat on the back! Email me and show me what you have done! I would love to see! Now for a spot of painting. The paint will make your canvas watertight. use cheap paint that you use for painting door frames, skirting boards... etc. 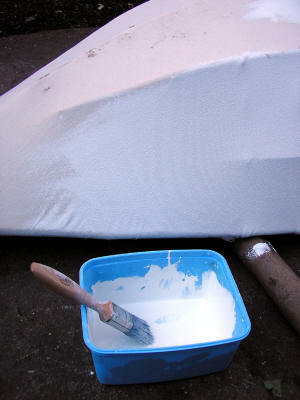 I gave my canoe 2 coats of under coat and 2 coats of over coat. You just need enough paint to fill the weave of the canvas. 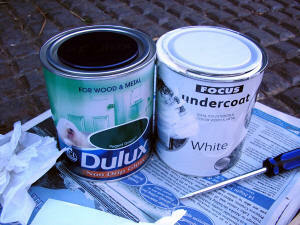 After each coat had dried I rubbed it over very lightly with very fine sand paper just to take the roughness off it. When a coat of paint is nearly dry if you rib it over with your hand the paint will fill the weave better and it will be smoother. Paint like this may sometimes take 24 hours to dry. Don't get impatient! It will all be worth it! Whilst the paint is drying you can be making your paddle. Put your life jacket on and take her for a test paddle! 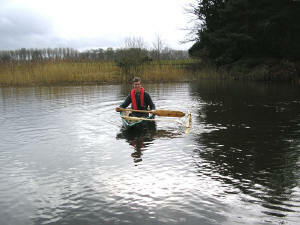 I funny thing about my canoe was that it was the first canoe I had ever been in and it was one I had made! A great feeling indeed! 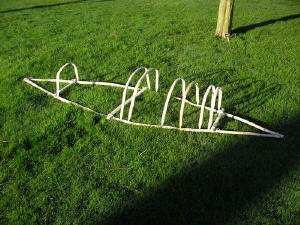 Being as it was my first time in a canoe I decided to make an outrigger for a bit of stability. The canoe is also very rocky! With the outrigger though it is a joy to paddle! 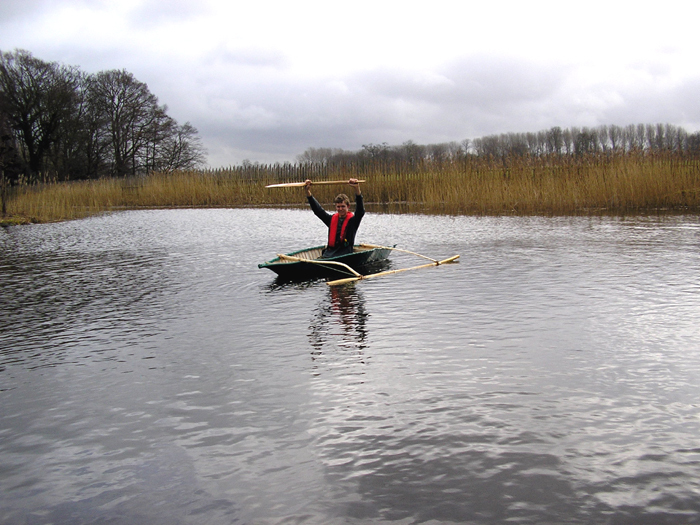 Don't sit in your canoe on land because you will risk putting too much strain on its framework! 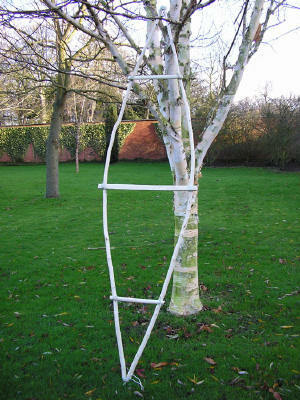 For more information and great advice visit the this thread on the Bushcraft UK forums!